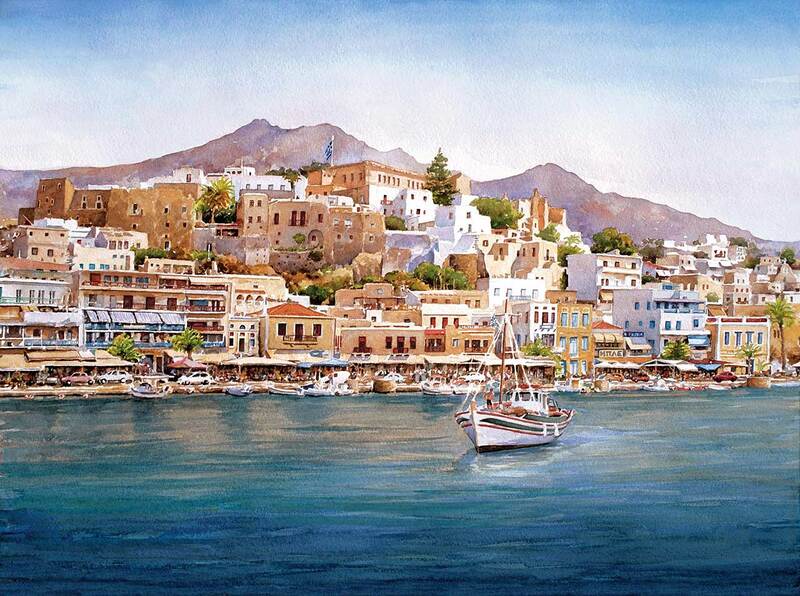 Imagine yourself on a Greek island – Naxos, let’s say – in a tiny white-washed house with Cerulean blue shutters that overlooks the Aegean Sea. Below your terrace, orange, yellow and cyan fishing boats bob in the small harbor and every few hours, a ferry bellows in on a plume of funnel smoke. The great boat bellies up to port and expels small cars and trucks and people by the score, scurrying like ants toward the village fortifications, before raising anchor and ponderously exiting westward. It’s late May and the sun on your tiled veranda is warm and brilliant. In the kitchen, beads of condensation sparkle on the carafe of pink wine that awaits you. It’s time to eat. This is what you are going to prepare. Measure out 3 T olive oil and set aside. Prepare tomatoes: Cut tomatoes in half lengthwise and lightly salt ; place them in a plastic food bag; add 2 T olive oil and toss to cover tomatoes well. 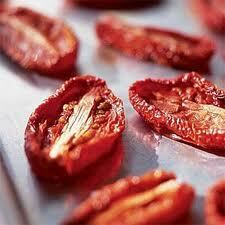 Remove and spread tomatoes on a cookie sheet lined with parchment or non-stick aluminum foil. Heat oven to 275; place tomatoes in oven four to six hours until slightly dry but still juicy. Remove and cool. If you don’t use them right away, store in a covered jar or food container in the refrigerator; tomatoes will keep three to four weeks. Prepare pepperoncini: Heat a large non-stick pan and add 2 T olive oil. When oil is shimmering, add peppers and saute quickly until the skin begins to blister, about two minutes. Turn over and repeat until all sides of the peppers are blistered and light golden in color. Remove peppers from pan and drain on paper towels. To serve, drizzle a platter lightly with olive oil; scatter minced oregano. Place block of feta at center of platter; you may slice the feta if you wish. Around the feta, place olives, tomatoes, pepperoncini. Drizzle feta with olive oil. Sprinkle platter with mint. Garnish with lemon wedges. This entry was posted in Appetizers, Brunch, Recipes from Adrienne's pantry, Salads, Sides, Vegetarian and tagged feta, fresh herbs, herbs, lemon, mint, olives, oregano, pepperoncini, salad, tomatoes, vegetarian. Bookmark the permalink.